Born and raised in the US Virgin Islands, Calvit continues to channel his Caribbean roots through groove-infused choreography, while maintaining his inner Florida style with high energy and entertainment value. He has traveled the world working with various artists such as CHRIS BROWN, USHER, CIARA, JASON DERULO, MILEY CYRUS, TINASHE, and IGGY AZALEA, just to name a few. 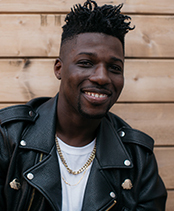 You may have seen his work as a co-choreographer for Rihanna’s “Diamonds Tour” and on her single “BBHM,” under the direction of Hi-Hat. Calvit has also choreographed for Rihanna’s VMA appearance accepting her Vanguard Award, as well as for artists such as CIARA, CL, MAJOR LAZER, JUSTIN BEIBER, and TINK. Most recently, Calvit has been keeping busy as the choreographer for THE BAND PERRY, with his work appearing in “Stay in the Dark,” on Jimmy Fallon Jimmy Kimmel, and their “My Bad Imagination” tour. Allowing for his passion to evolve into creativity, Calvit continues to develop a unique choreographic identity, blending his personal history, cultural influences, and dance technique into one fluid style.